South Korea's parliament is set to vote on whether to impeach President Park Geun-hye after a political scandal triggered off a mass wave of outrage - including a 2-million strong nationwide demonstration, the largest in the country's history. As part of Links International Journal of Socialist Renewal coverage of the crisis, we are republishing below, with permission, two articles from the latest World Current Report, published by the Seoul-based International Strategy Center. November 30, 2016 — World Current Report — President Park’s support ratings have sunk to 4% nationwide and 0% in the southwest, as well as 0% with those in their 20s and 30s. Public outrage has forced the mainstream opposition parties, as well as thirty two assembly persons from her own party, towards the ⅔ vote necessary to initiate impeachment. Amongst the public, the scandal has provoked protests with numbers in the hundreds of thousands every weekend. 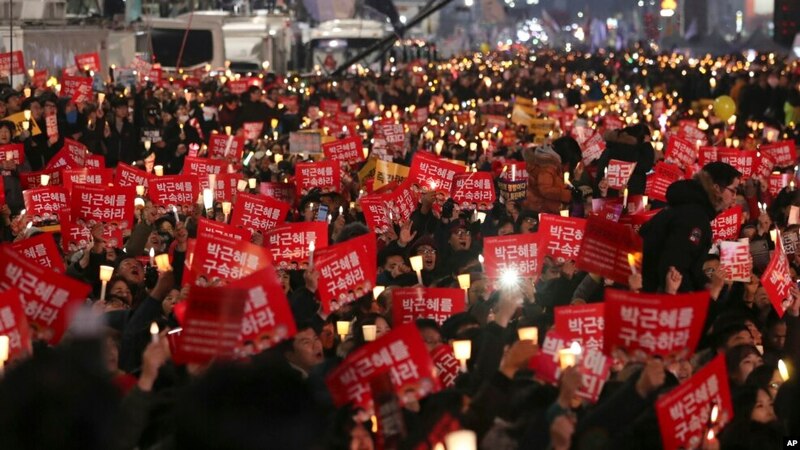 On Nov. 19, 1.2 million showed up in the heart of Seoul to call for Park’s impeachment, equal to the protests of 1987 that brought an end to the country’s dictatorship. Nov. 26 brought 1.6 million to Seoul and 2 million in total nationwide, making it the largest concentrated gathering in Korean history. Protesters ranged from toddlers with parents to middle school to college students, and included even the elderly. The spontaneous nature of this movement has even led to the coining of a new term for individuals attending a protest on their own: honchamro – the protest equivalent of the lone eater. New evidence keeps emerging about the complete corruption and abuse of power that Park committed. As her presidency crumbles under the weight of public pressure, what will the crisis mean for those seeking deeper social transformation? Calls for President Park’s impeachment started soon after she took office in 2012 after it was revealed that the National Intelligence Service had meddled in the elections on her behalf, a crime equal in magnitude to that which sparked the Watergate scandal for US President Nixon . They grew in size and volume with the botched rescue of the Sewol ferry. Grief turned to anger and anger to fury as the president averted and blocked every attempt at uncovering the truth and punishing those responsible for the tragedy. The chorus of protestations grew with President Park’s privatization of the public sector and her weakening of labor conditions. It intensified further with the death of 70-year-old farmer Baek Nam Ki shot by police water cannon during protests over the price of Korean rice. There had always been a sector of society directly impacted by the president and who felt deeply discontented with (even betrayed) by her. Yet it was the Choi Soon Sil scandal that turned Park from an unpopular president into an illegitimate one. If the first nick to her legitimacy began with suspicions that she’d helped a close friend collect funds from conglomerates for personal slush funds, then such nick spread into a deep crack when further investigations uncovered that the president had helped Choi’s daughter get preferential treatment at an elite Korean woman’s university. The deeper investigators probed, the clearer the all-encompassing the connection between Choi and President Park became. Nothing appeared free from Choi’s influence whether policies, top secrets, government posts, or favors for corporations and individuals. As the full extent of corruption and power abuse was revealed, the public, who had initially been irked by the whiff of corruption reported in the news, became first dumbfounded, then ashamed by the great depths of the scandal. That first weekend, 200,000 people came to Seoul to protest. Shame soon mixed with anger at President Park’s betrayal of Korea’s representative democracy: the president was supposed to represent the people, not Choi and her entourage. The president’s half-hearted apologies and lies only served to stoke the public’s anger and outrage. That weekend, 1.2 million came to protest in Seoul. The president’s unwillingness to be investigated despite her earlier promises of full compliance led to protests by another 950,000 nationwide. Driven by rumblings in their conscience, assured by the safety and festive nature of the protests, more and more people spill into the streets every weekend despite the cold and even snow. The protests have become a mash-up of agora, k-pop concert, and massive open-mic. Stuck with a clearly illegitimate president unwilling to step down and an opposition party too timid to impeach her, it has become the moral duty of the public to keep coming out and prod the opposition parties into action and dislodge the president from office. The latest manifestation on Nov. 26 involved an estimated 2 million people (4% of the population) coming out to the streets nationwide. Can such a massive mobilization of Korean society lead to deep fundamental change? Undoubtedly, even if President Park steps down or is impeached, many questions will still have to be answered: What about companies like Samsung, who contributed funds to Choi’s foundations and got a massive social security tax write-off? Or even worse, was there any connection between these contributions and President Park’s announcement the next day of labor reforms favorable to corporations and destructive to workers? What of the seven hours when 306 people were drowning in the Sewol Ferry? Was President Park really getting beauty treatments with Choi Soon Sil? Will public discontent spill into other policies and structures that immiserate people’s lives? At present, the public’s attention and pressure is focused like a laser on President Park and her resignation. Resignation or impeachment will be followed by calls for constitutional reforms to prevent repetition of such incident. Yet for those of us that organize, this fight is about more than simply Park’s impeachment – it’s about the making of a better Korean society. This political crisis offers space to engage with family, irregular workers, farmers, young part-time workers, students, women, artists, and run-of the-mill strangers in the streets, and the opportunity to organize them. One thing is certain: the ousting of a president won by the power of the people will be akin to the moment people realized kings were but men – they can be brought down. The Watergate scandal involved wiretapping of the Democratic Party’s headquarters during the presidential election by President Richard Nixon. As impeachment of the president became imminent, President Nixon resigned. 306 people, overwhelmingly high school students, drowned died in the Sewol Ferry as the government failed to rescue the people trapped inside. Over two years later, the ferry – a key component in recovering some of the still missing bodies and uncovering the truth – has not yet been recovered from the bottom of the ocean. Agora refers to an open space where people assembled. November 30, 2016 — World Current Report — In early October, students at one of the nation’s most prestigious universities caught wind that one of their peers, a 20-year-old student named Chung Yoo-ra, had been granted special admission to the school, even though she did not have the grades to meet the institution’s rigorous requirements. At the time, students at Ewha Womans University were already engaged in protests pressuring the university’s president to step down over accusations that she unilaterally decided to establish an extension school at the university without consulting students. The protests gained extra fire when they discovered that Chung had not only gained special admission to the school as an equestrian athlete — especially infuriating in a country where college admissions are notoriously competitive — but that she had also been given passing grades in eight of her courses at Ewha even though she did not attend a single class. The university’s president eventually stepped down, but this was only the beginning of a nationwide corruption scandal that would ultimately reach the highest office of South Korea. At around the same time the students were engaged in their protest, JTBC, a Korean cable news network, was busy sifting through files on a tablet PC left behind by Chung’s mother, Choi Soon-sil, who had fled the country as allegations of her involvement in government-level corruption began to surface. The computer revealed details about Choi’s wide-ranging influence in South Korea’s state affairs, from editing speeches of Korean President Park Geun-hye to vetting top ministerial posts. Later investigations found she had even strong-armed education officials to get her daughter into Ewha and pressured professors into giving her passing grades. Reports of Choi’s underhanded dealings were alarming, not least because she was a private citizen with no political experience or security clearance. Yet despite this, Choi, a longtime friend of President Park, was given unfettered access to a broad range of top-secret documents, including drafts of speeches before they were delivered, daily policy briefs from the presidential office and résumés of candidates for top government posts, including the minister of culture and the director of the National Intelligence Service, the Korean equivalent of the C.I.A. While South Korea’s citizens have seen their share of corruption scandals dating back to the era of military dictatorship, this most recent case of influence peddling is unprecedented. While past scandals involved a president’s family member receiving favorable government contracts or the president making off with public funds after leaving office, Choi’s influence in Park’s administration was unusually extensive. President Park appeared to have tailored many aspects of government to fit Choi’s needs, a relationship that Korean newspaper editorials have likened to that of a puppet and puppeteer. Choi is suspected of using her influence over the president to extort more than $70 million from South Korea’s largest conglomerates by having them donate to foundations that acted as her personal slush funds. In return, the Park government ensured the conglomerates received favorable deals and contracts, from granting duty-free shop licenses to approving mergers. Subsequent investigations have found that Choi may have also been involved in pressuring the South Korean government to purchase F-16 fighter jets for its military and that she may have played a role in the government’s controversial decision to deploy the U.S.-led Thaad antimissile system on the Korean Peninsula due to connections with lobbyists and officials at defense contractor Lockheed Martin. Choi also allegedly pressured Park to place her own associates in top government positions to benefit her friends and family. In fact, it was Choi’s associates in the Ministry of Culture, Sports and Tourism that helped her daughter receive a “special waiver” as an equestrian athlete to enter Ewha Womans University. Choi also ensured that many government projects went to her own friends. President Park, in turn, is said to have relied on Choi extensively for governance advice, even though Choi had no government experience. Within the presidential compound, Park developed notoriety for being aloof and difficult to reach, even by her own aides and ministers, and many now speculate she was attempting to hide the fact that she was consulting Choi on high-level matters. Rumors abound that the infamous seven-hour delay in government response after the deadly Sewol ferry sinking in 2014 was Park deliberating with Choi on what to do. Choi Soon-sil’s connection to Park Geun-hye began 40 years ago, when Park’s father, Park Chung-hee, was still in power as South Korea’s dictator. In 1975, Park Geun-hye, then just 22 years old, was still recovering from the shock of witnessing her mother’s assassination at the hands of a North Korean spy. Choi’s father, Choi Tae-min, was a cult leader who claimed to have the ability to heal people, and he saw an opportunity in an emotionally vulnerable Park Geun-hye to curry the favor of South Korea’s ruling family. Choi Tae-min sent letters to Park Geun-hye claiming the soul of her mother had visited him and that Park could communicate with her mother through him. She invited Choi to the presidential residence, where he gained Park’s trust and developed a relationship that would help him amass a fortune with the help of her influence. Park Geun-hye considered Choi Tae-min a mentor, and when he passed away in 1994, her trust moved to Choi’s daughter, Choi Soon-sil. The relationship remained intact throughout Park’s rise to power, from her first foray into politics as an assemblywoman in 1998 to her election as president in 2012. So powerful was Choi Soon-sil’s friendship with Park that even after revelations surfaced of the corruption, Park’s first apology included not a dismissal or renunciation of Choi, but rather an admission that she had relied on Choi as a friend for help in her speeches. In early November, about a month after Ewha students first discovered irregularities at their school, Choi was arrested by prosecutors and charged with embezzlement, tax evasion and acquiring classified government information. Two of President Park’s closest aides were later arrested on charges of conspiring with Choi, and on Nov. 20, prosecutors listed Park herself as a suspect in their investigation. Meanwhile, opposition parties in the National Assembly have begun the process of drafting a motion to impeach the president, while some angry members in the president’s own party are also creating splinter groups to push for impeachment. In order for an impeachment motion to pass the 300-member legislature, at least 200 votes are needed. The country’s three opposition parties and liberal independents currently occupy 171 seats, and the ruling party has reportedly secured more than 40 of their own lawmakers’ support, enough for the majority vote needed. A vote could come as early as Dec. 3. If the legislature passes the motion, Park’s presidential authority will immediately be suspended, with the prime minister serving as acting president while the country’s Constitutional Court deliberates on the legality of the impeachment. The court will have up to 180 days to make a ruling, and afterward, the country will have 60 days to hold a special election. Of course, there is also the possibility that Park could voluntarily resign. Analysts at Eurasia Group, a consulting firm that focuses on political risk, have put the chances of Park leaving office before her term ends at 70 percent. Gavin Huang is editor of World Current Report.